First you have quinoa, (a complete protein), add some black beans (more protein and fiber), throw in some corn, bell pepper and onions (yummy flavor and crunch), sprinkle with cilantro and toss in a fresh lime dressing (Yum). What you get is a simple and healthy salad that makes a complete meal . It’s the perfect salad if you pack your lunch! It’s also wonderful for dinner served with chicken or fish. I like to top it with tomato and avocado if I have them. You could also throw in some jalapeno if you want to turn up the heat. Make it your own and enjoy! For more info on the health benefits of Quinoa check out this great resource. You may also love Breakfast Quinoa featured here. Whisk together the lime juice, oil, cumin, chili powder, and black pepper to make dressing. Set aside. 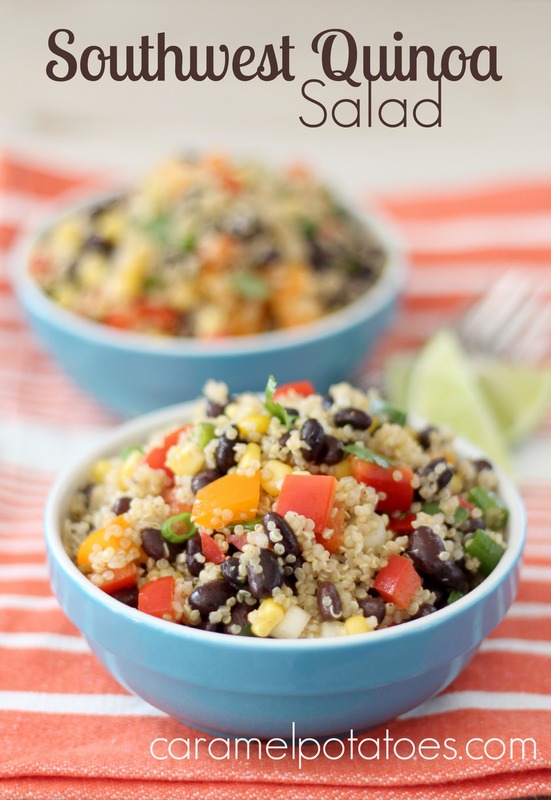 In a bowl, combine the black beans, corn, bell pepper, onions, cilantro, cooled quinoa, and dressing. Season with additional salt and pepper if desired. This look my kind of lunch. Yum.